At 9 o'clock in the morning we start driving from Leuven with my car completely full to return to Greece. Thanasis and Mina came to Belgium two days earlier. I drive direct with only a few stops, through Luxemburg and France to Switzerland. The weather is bad and it is raining all day. I lose the correct road in France and we enter in Switzerland from a customs in a small village. We load our car on the train in Kandersteg, and through a tunnel we reach Goppenstein. We arrive late at the night in Saas Fee Grud, where we stay in a hotel. We drive to Saas Fee, in the morning, and we leave the car at the village parking. At 10:00 we start trekking from Saas Fee (1700m). The weather is not good, with a lot of clouds covering the surround peaks. The path has a lot of Z and we reach gradually altitude. At an altitude of about 2600 meters the rocky ridge starts with via ferrata. At the same time it starts snowing quite heavily and the rocks was covered with almost 10 cm of fresh snow. We decide to continue carefully and reach the Mischabelhutte (3340m) at 15:00. We rest in the hut, the owner of the hut is very friendly and full of hospitality. 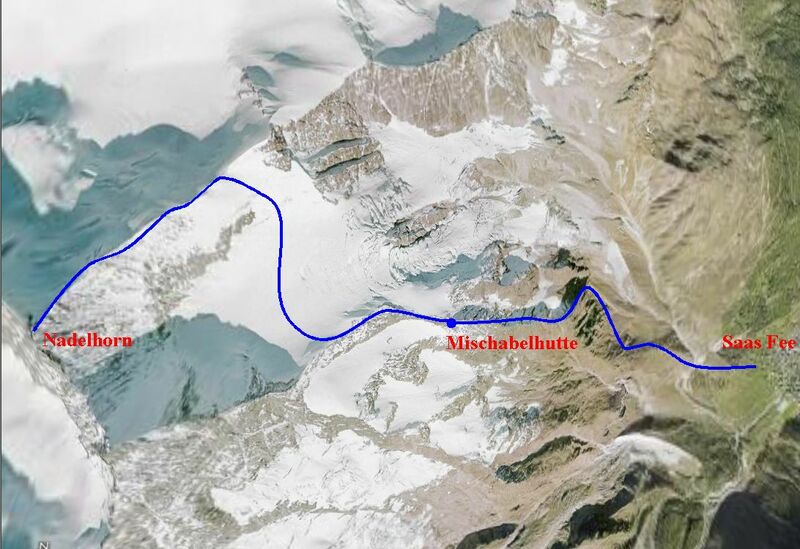 He also gives us details about the route to Nadelhorn. We wake up at 4:00 , Thanasis decidse not to continue higher and he stays in the hut. At 5:00 Mina and I start climbing the snow covered ridge. We follow the steps of a guide who left earlier. We traverse the ridge and cross the flat Nadelhorn glacier, which has no crevasses. We climbed roped together all the way. Three German climbers overpass us and we continue together up to the East col. From there we follow the NE ridge, which was quite steep and contains cornices in the south side. There was a strong wind from the north, and we had often to stop. Over 4000 meter the route was graded as PD and the last rocky pyramid was covered with fresh unstable snow. This makes the climbing quite difficult. 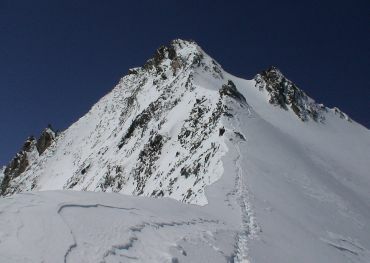 I have to make few pitches and finally we reach the summit of Nadelhorn at 10:00 after 5 hours of climbing. We stay only for a few minutes on the summit and we get very nice glimpses from the surround peaks of the Alps . We descent to the hut from the same route and we reach the hut at 12:45 . We decide to stay there one more night, because we had plenty of time. We descent from the Mischabelhutte to Saas Fee, the previous warm day melt the snow on the rocks and the descent was easier. After 4 hours we reach Saas Fee where we stay for a couple of hours. We had lot of time until the ferry in Venice so, we decide to visit Dolomites and we start driving direct to Trento in Italy. We arrive in a small village near Trento where we find a hotel to stay at the night. We drive around the small villages in the beautiful Dolomites area and we stop in an alpine lake named Lago di Fedaia at 2053m altitude, on the slopes of Marmolada mountain. We saw a map in the cafe and we decide to do a trekking, following the path No 698 which guides to the col named Porta Vescovo (Refuge L Gonza 2478m). 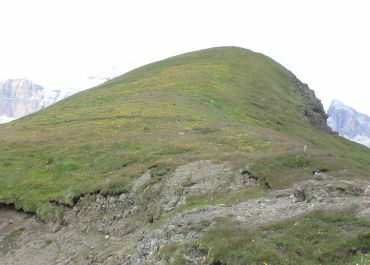 From there a small path guides through steeper slopes to the green summit Belvedere 2648m. We reach the summit at 13:50 from where we had very nice views of the Dolomites. We descent following the same path. We drive many hours and we reach Cortina d' Ambezzo at the afternoon, where we stay at night. 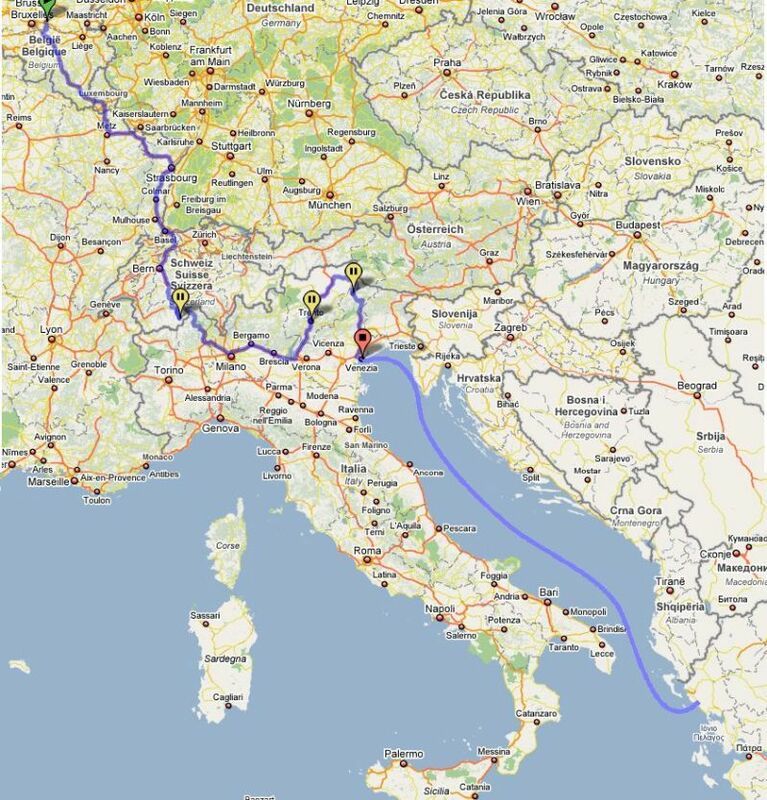 We leave very early in the morning from Cortina and drive thought the highway to Venice. A lot of people, cars and trucks waiting at the port to enter in the boat to Igoumenitsa. At noon we left from Venice and next day we arrive in Igoumenitsa (Greece). I drive to Larisa where I left Thanasi and Mina to continue by train to Xanthi, and late in afternoon I was in my house in Elati.